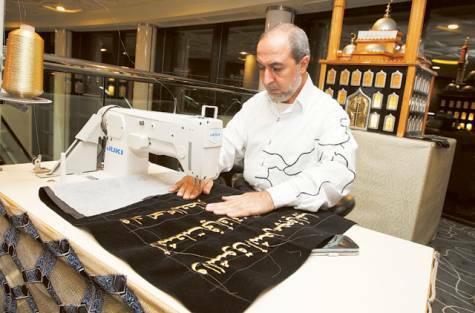 Mohammad Mahir Hadri uses an ordinary sewing machine, silk yarn, velvet sheets and his extremely skillful hands to create Arabic words, verses from the Quran and calligraphic designs. Currently exhibiting his works at the Dubai Chamber of Commerce, as part of the Dubai International Holy Quran Awards (DIHQA) exhibition, Hadri’s work has attracted a lot of attention and acclaim. Hadri said that this is the first time he’s exhibiting the entire Quran. Previously his works have been exhibited in several countries but only in parts. He is really grateful to Almighty Allah for bestowing this talent to him which he could use in His cause. From two-metre long frames displaying chapters of the Quran and wall hangers with words of wisdom to scrolls and booklets containing selections of the Prophet Mohammad’s (PBUH) sayings, Hadri has come up with a wide range of work that demonstrate his skills. But the tome of all his efforts is the 12-volume reproduction of the Quran done in embroidery and velvet that took eight years to make. A trained calligrapher and embroider, Hadri creates his works in five popular scripts – Diwani, Sulus, Riqah, Naskh and Osmani – and he has done his magnum opus in the Osmani script which is the most popular of all. The embroidered Quran contains 426 pages, weighs 200 kilograms and is worth 5 million euros (Dh24 million). The artwork, which is verified for authenticity and approved by three government-appointed Syrian scholars, is the only copy of the Quran in the world done in this unique style and Hadri is willing to offer it to any interested art lover. The artwork, along with a live demonstration of Hadri’s skills can be seen at the Dubai Chamber of Commerce every day between 10pm and 12 midnight until the end of this month. The work of Hadri should not only be appreciated by offering a handsome amount of money but also by bestowing him with recognition which he deserves. This is some extra ordinary stuff by this talented man.